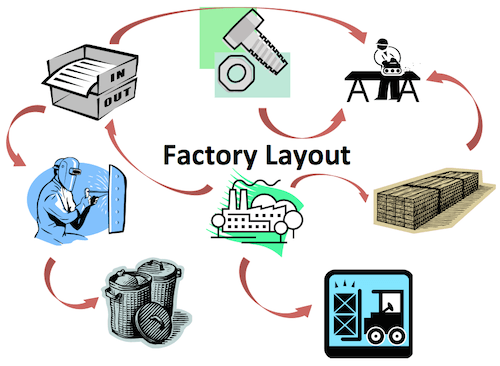 Whether you are moving into a new factory, changing the layout of your current facility to improve workflow or making room for a new piece of equipment, your team must consider the 7 flows during the factory design. How are the raw materials replenished in the cell? How do we signal a quality problem? Can they be located close to my workstation? How do we move WIP around the cell? How do we make sure the correct job is being worked on? Where does the finished assembly go? Onto the next cell? Or onto Dispatch? Do we need a quality check? How do the people move around the cell? Are they helping or hindering each other? How are the work instructions displayed? How are any waste materials removed? TXM can help with your Factory Layout. The TXM Lean Plant Layout Development Process provides the focus you need to get your team working together throughout this challenging time. It is based on understanding your business and produce flows using the Value Stream Mapping approach. From here, detailed cell designs can be determined, considering the seven flows, as outlined above, as well as the cell workload to optimise the layout for that product range. These cell layouts are then look at in the context of the factory to determine the best layout with the equipment and facilities you have. Then the TXM team will do it again and again until we have covered several options. This gives your team the opportunity to try out different options and layouts, noting the benefits and problems with each layout and finally coming to an agreed layout the meets most of the criteria, while understanding when compromises may have been made. The best time to improve your factory layout is before you have shifted into a new building – putting in the effort to develop a good factory layout before you have moved will save you money, time and the stress of getting it wrong!